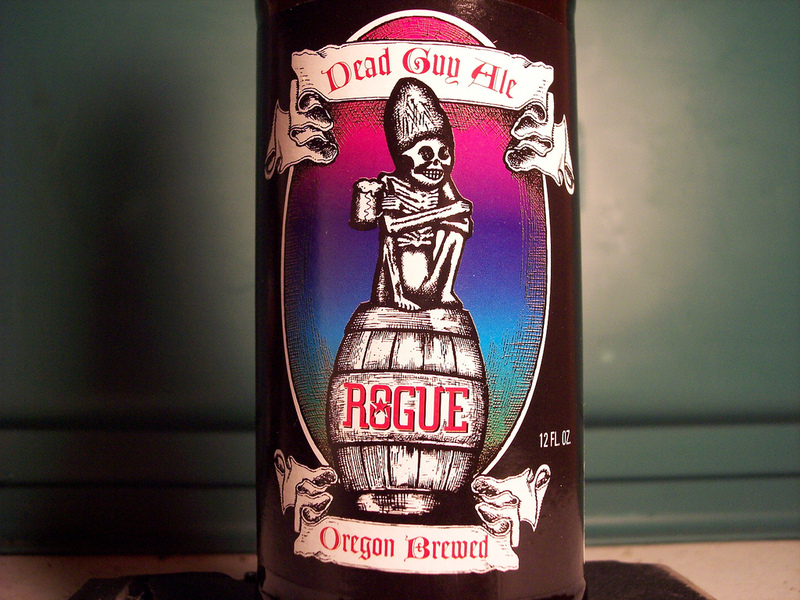 Today’s featured beer is Rogue’s “Dead Guy Ale,” which is a German Maibock, or in other words a strong golden lager. Rogue is a West Coast brewery located in Portland Newport, Oregon. You can expect to spend around $13 for a six-pack of Dead Guy, which is definitely pricey, but far from the most expensive craft brew on store shelves. Rogue doesn’t print the alcohol content on the bottle, but a little research reveals it to be 6.5% ABV. Rogue — In the early 1990s Dead Guy Ale was created as a private tap sticker to celebrate the Mayan Day of the Dead (November 1st, All Souls Day) for Casa U Betcha in Portland, Oregon. The Dead Guy design proved so popular with consumers and especially Grateful Dead fans, that we made it the label for our Maierbock ale. Even though the association with the Grateful Dead band is pure coincidence, we have gratefully dedicated Dead Guy Ale to the Rogue in each of us. Dead Guy Ale is a beautiful honey color with a bit of red mixed in, making for a solidly dark amber complexion. I’m a fan of IPA’s, and while Dead Guy is not an IPA, it has some of the same hoppy characteristics, just toned down a notch or two. This hoppy character is only evident briefly before fading into a satisfyingly well-rounded beer. Dead Guy is not too hoppy, not too malty, not too sweet, with just the right amount of carbonation, and an aftertaste reminiscent, again, of a mild IPA. But don’t worry, there’s no overbearing hoppy bitterness here, and because of it’s well-rounded character, Dead Guy doesn’t lay heavy, making it equally suited for a hot summer day or a cold winter’s night. If you are looking for a delicious craft beer to introduce as an “exotic” option for your Corona-drinking friends, Dead Guy might be worth a try. As for the more seasoned beer drinkers, one Dead Guy leads to another.